Super Flat Capo Gianni Need Help? The Flat Top shape is a modern take on classic acetate sunglasses, with a straight line and crisp clean edges. ‘CAPO’ Italian for Boss, is befitting its namesake — It is the upper echelon high ranking piece of the collection. A nod to the late iconic Italian designer Gianni Versace. 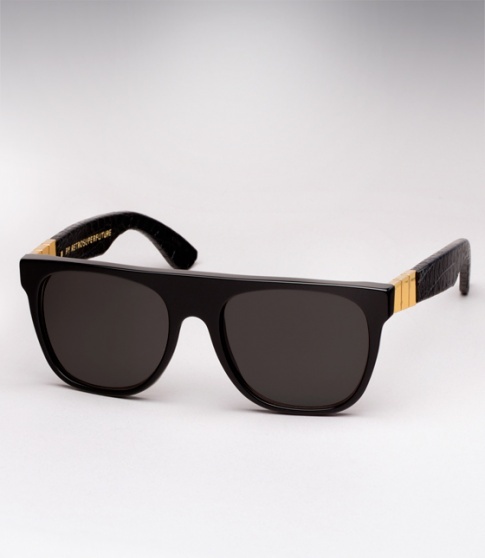 Classic black sunglasses with chunky 3 bar gold detailing and Italian croc-embossed leather on the temples evoke an era, style, and culture of success in excess. The 1990’s brazen aesthetic is transported perfectly into the present day. Whether dressed up or down, the Gianni Capo is undoubtedly a crisp addition. Showy and a definite head turner. What more can we say, the pictures speak for themselves.